From the street enter into the cool, tiled reception area and take a few steps to the first floor. Set on two levels, entrance to the apartment is through a spacious hallway with large mirror feature. Double sliding doors take you through to the generous lounge area which has a bright and sunny aspect. The large flat-screen TV means you can keep up to date with all the world-cup action! 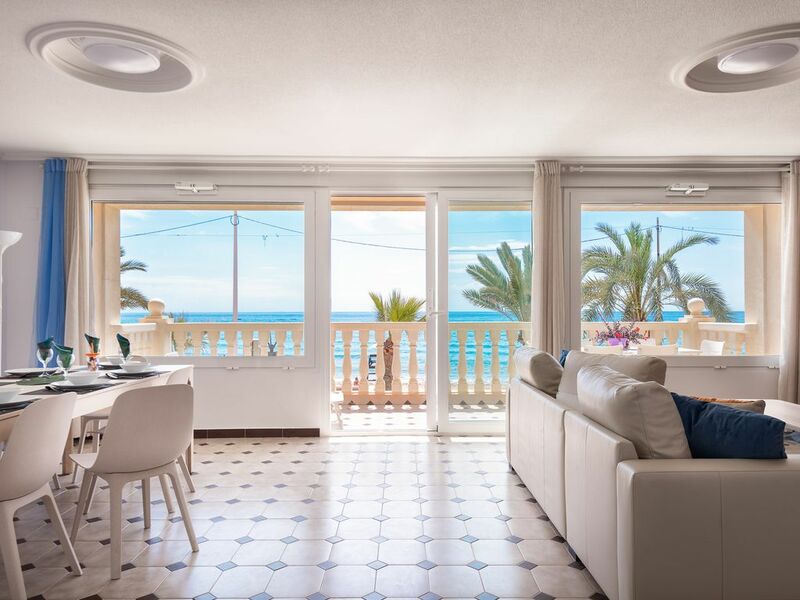 Step out onto the furnished balcony which overlooks the stunning sea and sands of El Campello. A hallway will take you through to the ample kitchen which is fitted with fridge-freezer, double sink, dishwasher, hob, electric oven, extractor fan. The kitchen has ample amenities including juicer, coffee-maker, microwave, toaster. Located just off the kitchen is an open courtyard with a laundry area, including washing-machine, double sink, cleaning equipment. The family bathroom has double vanity units with his and hers sinks, toilet, bidet and shower. Bedroom One is newly fitted-out with brand new bunk beds sleeping three. The sliding fitted wardrobes are contemporary in style and have plenty of hanging space. Fully air-conditioned. A small set of steps will take you up to the next level to bedrooms two and three. Bedroom Two has two single beds, air-conditioning, a wardrobe and drawer storage. Double french doors lead out onto a furnished balcony overlooking the street below. The fully-tiled bathroom has a new over bath shower with shower screen, toilet, bidet, mirror and storage. Bedroom Three has three single beds, fitted wardrobes, persian blinds and air-conditioning. Robinsons Rentals is a professional holiday rental agency which has been established here in El Campello, Alicante since 2012. We are fully accredited and registered with the Tourist Board. We are continually trying new ways to satisfy our clients and home-owners. What makes us different from other agencies is our attention to detail, great customer service and value for money. That is why many of our clients have returned to us and recommended us to their friends. We provide professional photographs, a detailed description of property features and facilities, local amenities etc. Our holiday villas and apartments are a welcome alternative to expensive hotels. 5 of us shared this large apartment which can accommodate 9. Plenty of dining space in the lounge, kitchen and balcony. The decor was traditional yet bright and well equipped with all you might need. It could do with another couple of comfortable chairs in the lounge for watching tv but in the summer folk would be outdoors instead of watching tv, We spent most of our time on the balcony watching the world go by on the traffic free esplanade. The only small problem we encountered was immediately rectified by the agent. We had the opportunity to view the other 2 apartments in the building on the 2nd and 3rd floor both of which slept 6 and were more modern and high tech. We were delighted that there were several bars and restaurants close by as many were closed being February.